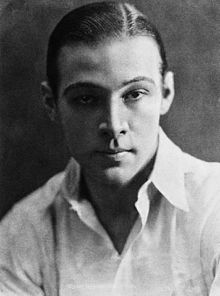 Rodolfo Valentino (nombre artistico de Rodolfo Alfonso Raffaello Pierre Filibert Guglielmi di Valentina D'Antonguella , naixito de Castellaneta (Italia) o 6 de mayo de 1895 y muerto en Nueva York (Nueva York) el 23 d'agosto de 1926, estió un destacato actor italián, activo en o cine estatounitense dende zaguerías d'os anyos 1910 dica a suya muerte, encara que desembolicó a suya carrera cinematografica mientres o cine mudo. D'entre a suya muit ampla filmografía, se puet destacar cintas como The Four Horsemen of the Apocalypse (1921), The Sheik (1921), Blood and Sand (1928), u The Son of the Sheik (1926). 1914: My Official Wife, de James Young. 1916: La corsara, de Maurizio Rava. 1916: The Quest of Life, de Ashley Miller. 1917: Patria de Jacques Jaccard, Leopold Wharton, Theodore Wharton. 1917: Alimony, de Emmett J. Flynn – non accreditato. 1918: A Society Sensation, de Paul Powell. 1918: All Night, de Paul Powell. 1918: The Married Virgin, de Joseph Maxwell. 1919: The Homebreaker, de Victor Schertzinger. 1919: Virtuous Sinners, de Emmett J. Flynn. 1919: Big Little Person, de Robert Z. Leonard. 1919: A Rogue's Romance, de James Young. 1919: Nobody Home, de Elmer Clifton. 1919: Eyes of Youth, de Albert Parker. 1920: An Adventuress, de Fred J. Balshofer. 1920: Passion's Playground, de J.A. Barry. 1920: Once to Every Woman, de Allen Holubar. 1920: The Wonderful Chance, de George Archainbaud. 1920: Stolen Moments, de James Vincent. 1921: The Four Horsemen of the Apocalypse de Rex Ingram. 1921: Uncharted Seas, de Wesley Ruggles. 1921: The Conquering Power, de Rex Ingram. 1921: Camille, de Ray C. Smallwood. 1921: The Sheik, de George Melford. 1922: Moran of the Lady Letty, de George Melford. 1922: Beyond the Rocks, de Sam Wood. 1922: Blood and Sand, de Fred Niblo. 1922: The Young Rajah, de Phil Rosen. 1924: The Hooded Falcon, de Joseph Henabery. 1924: Monsieur Beaucaire, de Sidney Olcott. 1924: A Sainted Devil, de Joseph Henabery. 1925: The Eagle, de Clarence Brown. 1925: Cobra, de Joseph Henabery. 1926: The Son of the Sheik, de George Fitzmaurice. Se veigan as imáchens de Commons sobre Rodolfo Valentino. (en) Rodolfo Valentino en IMDb. Zaguera edición d'ista pachina o 28 abr 2014 a las 19:15.